Seeing that today is yesterday was the day that the movie, Avatar, became available on DVD, I couldn’t help *borrow* one of the more critical lines from the movie. The phrase, “I see you” is an obvious nod to the indigenous people of North America who used the phrase to communicate a deeper acknowledgement of one another versus a throw away, “hi” or “how are ya” like we might use today. The bigger question one might ask is, where the hell is this post going? I’ve been spending a lot of time recently with my colleague, Joseph Jaffe, presenting to clients and prospects about the power of social. Part of the presentation talks about what our company, Powered, can do to help companies get the most out of their social initiatives. The balance focuses on the premise of Joe’s most recent book, Flip the Funnel, where he talks about tapping into existing customers to gain new ones. In the book, Joe gives dozens of examples of companies and organizations using the new customer service which relies heavily on social media to operationalize and scale these activities. 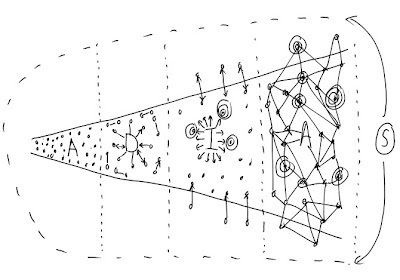 While I’m not 100% where each of these experiences fall in the four phases of the “flipped funnel,” (maybe Joe will head on over and help me out on this one), I can tell you that I feel a deeper connection with each brand AND I have gone out of my way to evangelize on their behalf. What’s important to note is that I’m evangelizing not because they gave me something but because they did something good and unexpected. In each case, I’ve been completely transparent about what I’ve received and if there was any monetary value associated. Several weeks ago, I needed to do 5 minute clip for my friends at AdVerve. The audio had to be clean and crisp so wasn’t a 100% convinced I could accomplish this goal through my computer or using my normal phone recording device. When I turned to Twitter (thank you Bryan Person, a friend and fellow podcaster), a few folks validated that iPadio was a good solution. Between my tweets about them, a mention on my weekly Quick’n’Dirty podcast show and several podcasts on their platform, they opted to make me their “featured guest of the week.” Needless to say, I was ecstatic. And guess what, no money changed hands. This is an interesting story. A few months ago, my sister-in-law and her husband gave us a Sonos (a wireless multi-room music system) as a house warming gift. Ironically, you actually need to have a wired connection with the first “box” you buy to be able to create an ethernet in your house/apartment. Not knowing this and having the disadvantage of a cable modem that was not near my stereo/speakers kind of ruined my excitement around my new Sonos device. I shared this disappointment with my friend, Jim Storer, who has a Sonos system himself and helped me deduce that I could remedy the problem with a $99 hardware solution. Without saying a word publicly, I got this public tweet from Thomas Meyer — the man who runs social at Sonos. Within minutes, we had connected via e-mail and Thomas let me know that he would be sending me the $99 piece of hardware after noting, I’m bummed we weren’t able to educate you properly on the need for the first wire. Wow! I told Thomas that I would be happy to tweet/blog about his kind gesture and his response via e-mail was, I never ask or expect anything. I’m simply in the business of trying to make people happy – either with music – or by solving problems they are having listening to their music. What happens from there is up to you the consumer. Let’s first work on making you a happy Sonos customer. I’m happy to let you know Thomas that this is definitely a case of mission accomplished! My job is focused on all things social media (my company helps big brands like HP, H&R; Block and Kodak think about how to incorporate “social” into their marketing plans). 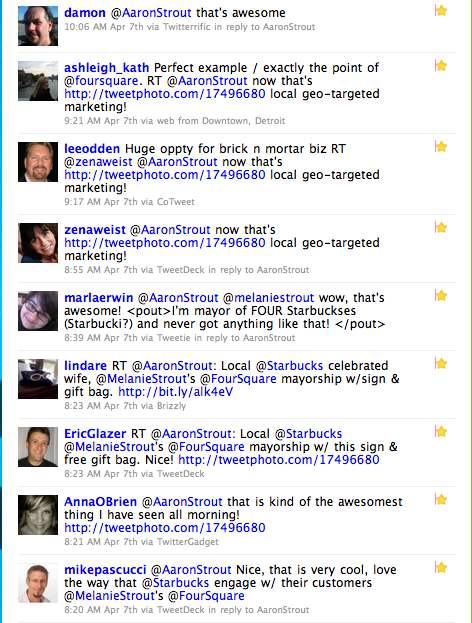 As a result, I spend a lot of time using social media sites/tools, one of which is location-based service, FourSquare. The reason I mention this is that my lovely wife, Melanie, has worked hard to try and understand what I do on a day-to-day basis at my job so she’s started using some of the same social media sites/tools that I have. nd shared this excitement with your staff (I had been the previous mayor so Melanie alerted Tasha and the staff that she was working hard to wrest the title from me). 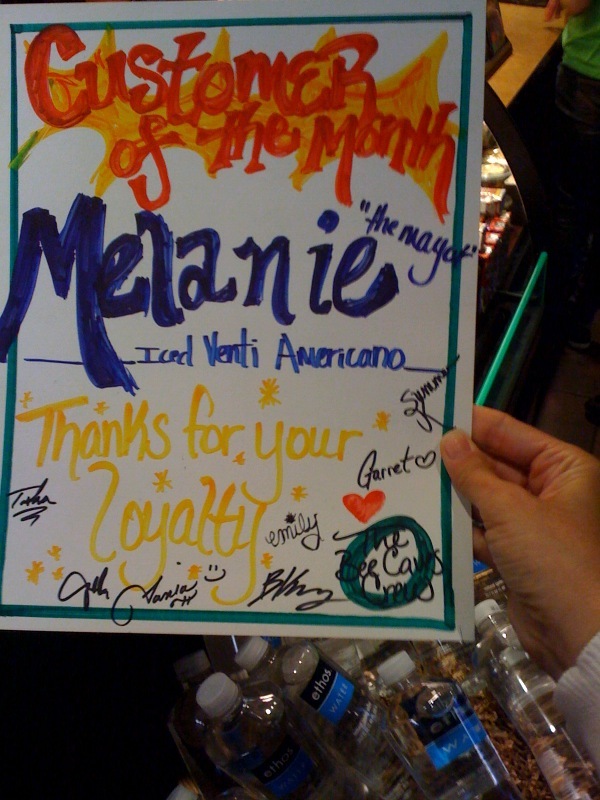 Well, your staff took Melanie’s excitement about her mayorship (a demonstration of her loyalty to this particular Starbucks) and decided to award her the “customer of the month” (see the picture below). This of course THRILLED Melanie so when she told me, I couldn’t help but share this with my “networks” which happen to be about 15,000 people strong. The reason Tasha, Melanie and I thought that you might care is that you received A LOT of positive feedback from some leading bloggers, Twitterers and Facebook users. I’ve added a couple of links to the blogs/FB updates and the Tweets below. Of particular note, one of the leading marketing Bloggers in the world, Lee Odden, and director of social media at Ernst & Young, Ken Burbary, weighed in on this activity. I also had a request from the person that leads social at a large retailer with a request to include the picture of Melanie’s “customer of the month” sign in a presentation she’s giving next month. So, this was a long-winded way of saying, congratulations and thank you and your team for doing the right thing. As I mentioned, I spend a lot of time in this space so seeing smart companies like Starbucks empower their stores to do things like this are very exciting to say the least. A much shorter story here but equally rewarding. A few weeks ago, I heard some folks talking about the latest Roku player — an inexpensive device that lets one stream Netflix, Pandora, Flickr and most importantly, MLB.tv. As an avid Red Sox fan living outside of New England, I simply can’t live without watching and listening to my hometown heroes during the summer. Last year, I used the kludge approach of plugging my laptop into my tv using a cable. It worked but the quality wasn’t great and it was a pain anytime we wanted to watch. This year, I was determined to make it simple enough so that at the click of a button, I could stream MLB games into my living room with ease [as a side note, using Roku and MLB.tv, one can not only stream games to one’s tv but can also watch games from the beginning, starting with a certain inning or even archives of past games]. My story here is the fact that after talking up Roku once I decided to buy the player, I found out that their MLB.tv interface wouldn’t actually be ready until mid-April. Granted, this isn’t a problem for an ordinary person but as an avid fan, I couldn’t bear the idea of being without the Sox for 10+ days. So, I tweeted to @RokuPlayer on Twitter and let them know that I was a little disappointed with the fact that I couldn’t use my player yet for the very reason that I purchased it for. The solution? An invite into their private beta so that I could start enjoying MLB.tv through Roku sooner than the general public. Yes, one might argue that Roku should have just made sure that their MLB.tv interface was ready for everyone out of the gate but at least they were willing to help out someone that demonstrated that they cared. This is a case of no money changing hands but the simple invite into a beta program returned me to “avid fan” status. Last October at Blog World Expo, I met Jess Berlin, the head of social for Cirque du Soleil. While I didn’t get a chance to spend a ton of time talking with her, I was pleased and impressed when she showed up for a panel I moderated with Reem Abeidoh, Lucretia Pruitt, Micah Baldwin and Jesse Stay (and trust me, I know she was there for them, not me, but I was impressed none-the-less). Following that event, Jess and I stayed in touch via Twitter and before she could say, “Bob’s your uncle,” I had her signed up as a guest on the Quick’n’dirty podcast show. Jess of course was a fantastic guest and interestingly, one of the things we talked about on the show was how she — on behalf of Cirque — reaches out to influencers to get them to experience their shows. Chris Brogan did a nice write up on this post Blog World Expo 2008 which I think epitomizes the approach. Fast forward a couple of months and Jess is telling both Jennifer and I that she would like to give us tickets to Cirque in SF (for Jennifer) and Austin (for me). Needless to say, the offer was with no strings attached but I can happily say, I loved the show (Alegria). It was exciting, breathtaking, visually stimulating and no animals were harmed! So what’s the moral of the story? 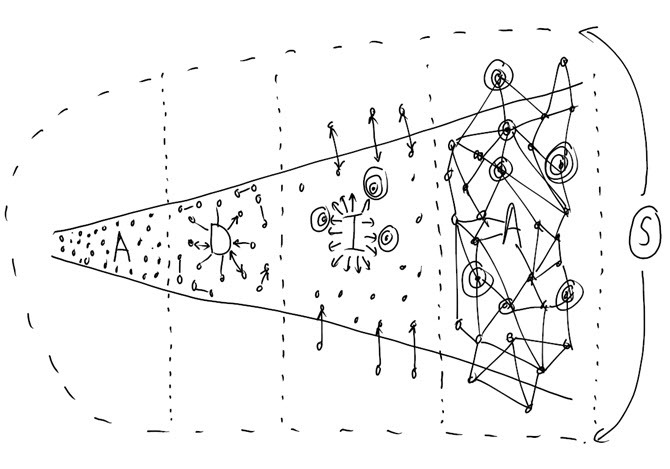 Companies need to do a better job “seeing” their customers. This doesn’t need to include money. However, it does mean taking a little more time to get to know, acknowledge, interact with and incentivize their customers. When done correctly, this results in activation which equals referrals, evangelism and great word of mouth in general. Are you “seeing” your customers?